I've included two versions of this project: you can use the templates to create the felt version (above), or use the embroidery pattern to stitch the whole design (below). 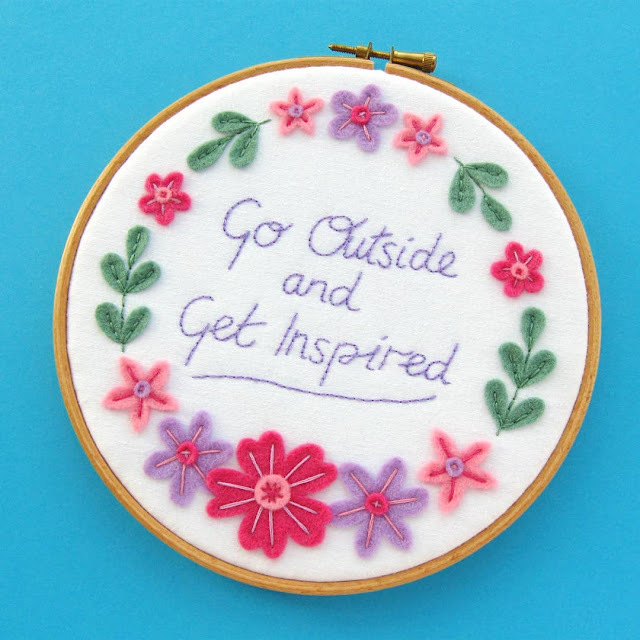 The pattern is designed to be displayed in a 7 inch embroidery hoop, but it would also look lovely as part of bigger projects - e.g. embellishing a bag, or as the central panel in a quilted cushion cover. 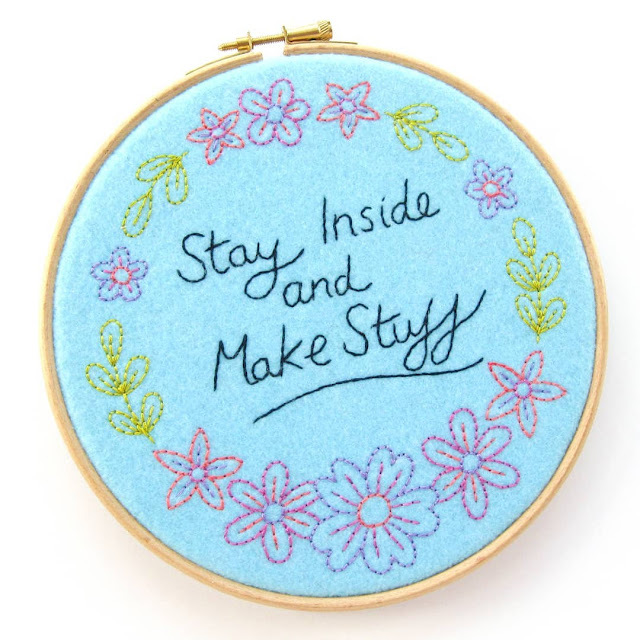 As you can see, I've also included two text options for the space inside the wreath: Go Outside and Get Inspired, and Stay Inside and Make Stuff. You could make both versions to display as a pair, or just choose your fave! The wreath would also look fab on its own, I think, or you could add your own text. This would also be a great design to personalise to celebrate a new baby, a wedding, an anniversary, etc. And course you could also use the felt flowers and leaves in smaller groupings to decorate other projects. Sooo many crafty possibilities! I'm running a little behind with my pattern newsletter projects at the moment but please bear with me: you'll still recieve a free project for every month this year and there'll be a bonus project at some point this year, too! I have some really fun makes planned for you guys and I hope you'll consider them worth the wait. Click here for more information about my newsletters and to subscribe! Click here to visit my tutorial archive for lots more free patterns, including lots of floral projects! Today I'm sharing a tutorial for making a fun crafty wreath from your old empty reels of sewing thread! This tutorial is sponsored by Bostik, and is part of a series of crafty projects I'm sharing to promote their range of adhesives. Click here to see all the posts in the series! 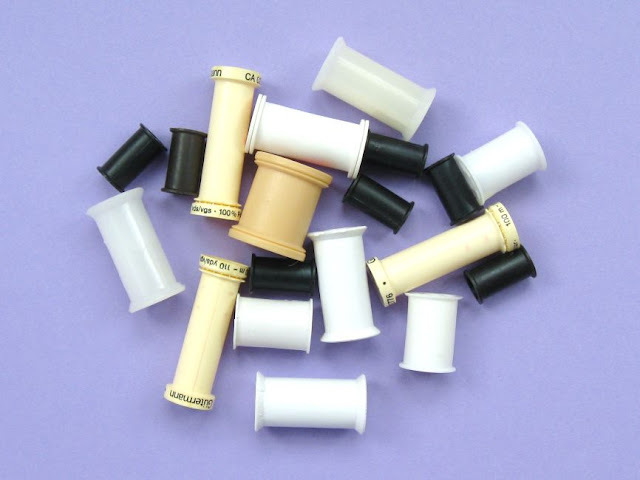 I'm never sure quite what to do with my leftover thread spools - they don't really have an obvious purpose but I still can't quite bring myself to throw them away. "I'm sure these will be useful for something" I think to myself, sticking them in a box of craft supplies... and then never actually doing anything with them. I bet you guys have a bunch of stuff you keep like this, too, right?? You just never know when stuff might come in useful for crafting! 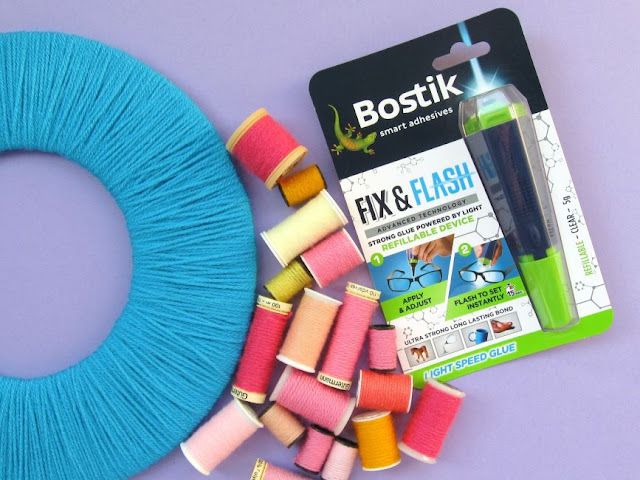 So, when the team at Bostik asked me to come up with a project to try out their new Fix & Flash glue I thought this would be the perfect opportunity to get out my stash of empty spools and actually make something with them. Making this wreath I also got to use up a bunch of scrappy bits of leftover yarn I'd been saving for ages AND I saved a bit of cash by making my own wreath base from a cardboard box instead of buying one. Essentially I felt like a crafty upcycling genius working on this project. 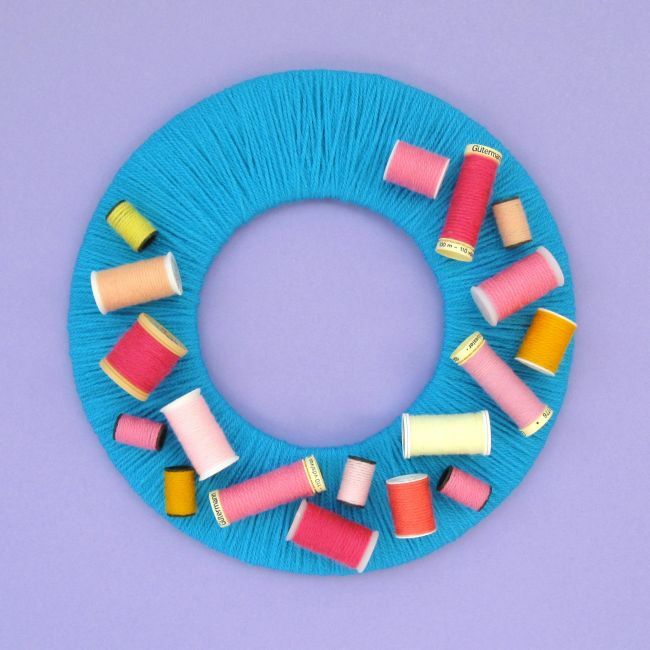 Tip: if you don't have any empty thread reels but like idea of making one of these wreaths for your craft room, you could also make this project using a box of cheap sewing threads or those thread colours in your stash that you somehow have loads of but never actually sew with. If you're making your wreath base from card instead of using a shop-bought one you'll also need sturdy craft scissors, a pencil, and things to help you draw the wreath shape (I used a compass, a ruler and a large dinner plate). 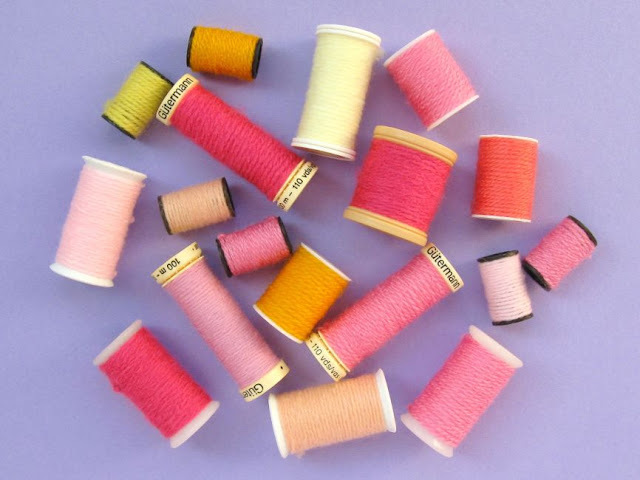 You will also need some PVA or other craft glue if you're decorating your reels with felt, paper or fabric. 1. 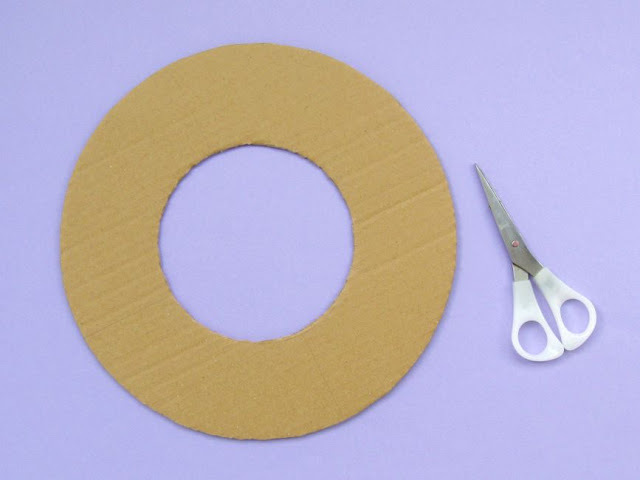 If you're making your own wreath base (instead of just buying one from a shop), you'll need to cut a large ring shape out of sturdy cardboard. 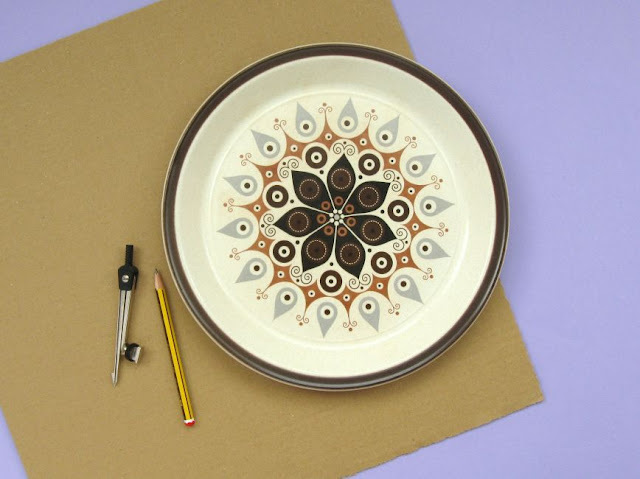 I used a large dinner plate (approx 26 cm wide) for the outer circle, drawing around it with a sharp pencil. I then used a ruler to find the rough centre point of the large circle, and used a compass to draw the inner circle (approx 12.5 cm wide) around that central point. 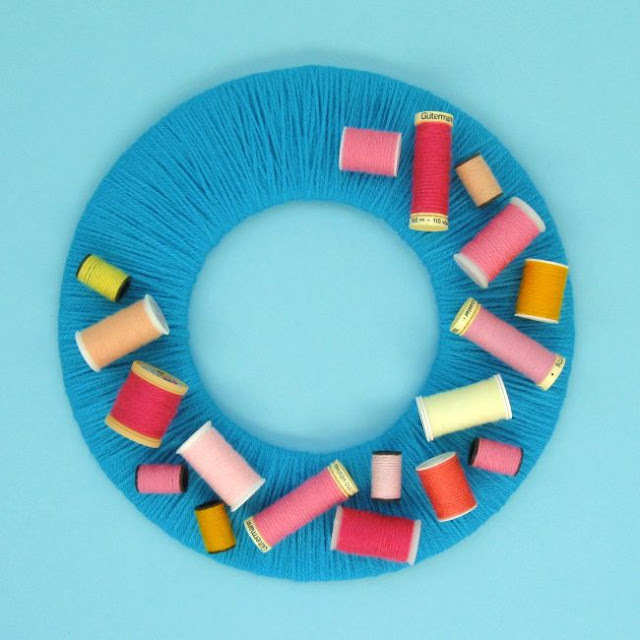 It doesn't matter exactly what size wreath base you make or use, just ensure you've got enough space to add all your sewing thread reels! 2. Use some brightly coloured yarn to wrap your wreath base. Knot the end of the yarn around the ring shape, tying it securely so the knot will be at the back of your finished wreath. Then gradually wrap the whole of the wreath with yarn until the shape is evenly covered and there are no gaps for the base to peek through. When you're happy with how it looks, cut the yarn end and knot it securely at the back of the wreath. This step is quite time consuming, but it's a lovely relaxing task to do on the sofa in the evening while watching a bit of telly! 3. Now it's time to decorate your empty thread reels. 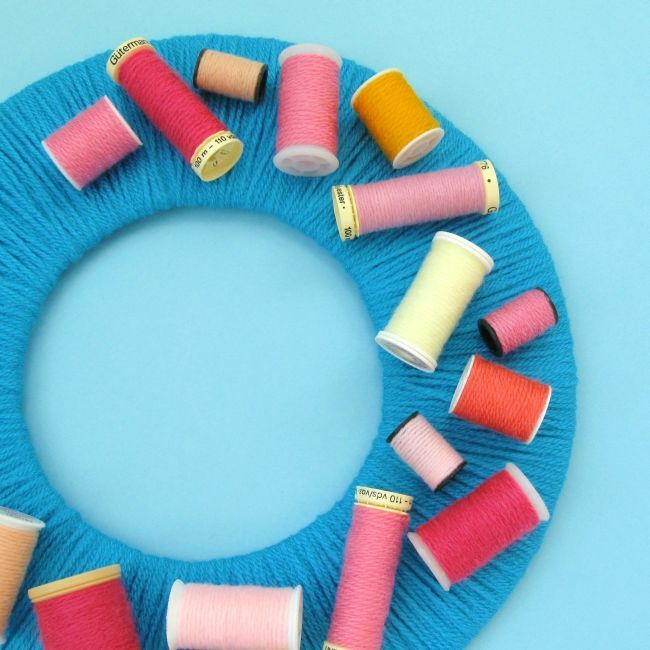 Leftover bits of yarn are perfect for this, but you could also use pieces of felt or even colourful paper or fabric to wrap around the empty spools - just cut the colourful scraps to size and glue them in place with the appropriate craft glue. When choosing colours you could stick to a strict colour palette for your reels, create a riot of different colours, or even create a rainbow effect across the wreath. I had lots of bits of leftover yarn in pink and other warm tones, so I chose a selection of those. Tip: if you want a rainbow or another sweep of colour across the wreath, plan ahead and work out how you're going to position the reels before you start adding colour to them so you know which reels to add which colours to. 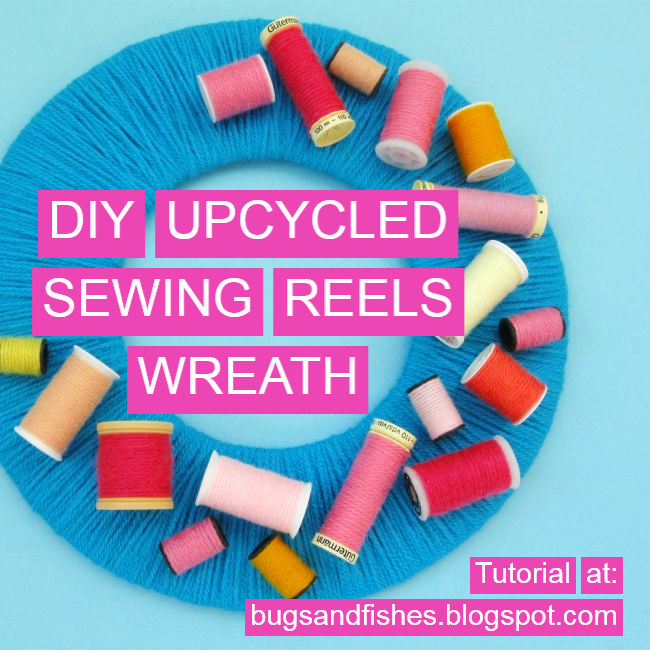 I'd recommend using a large piece of paper and a pencil to mark out the positions of each reel, which you can then refer to as a guide when attaching them to the wreath. Wrap each empty reel with some leftover yarn, knotting the ends securely and trimming them neatly. Make sure both knots are on the same side of the reel, so you can hide them when you stick the reels in position! I hid the first end of my yarn under the rest as I wrapped it around the reel and used a sewing needle to help me loop the second end into the rest of the yarn to secure it. 4. 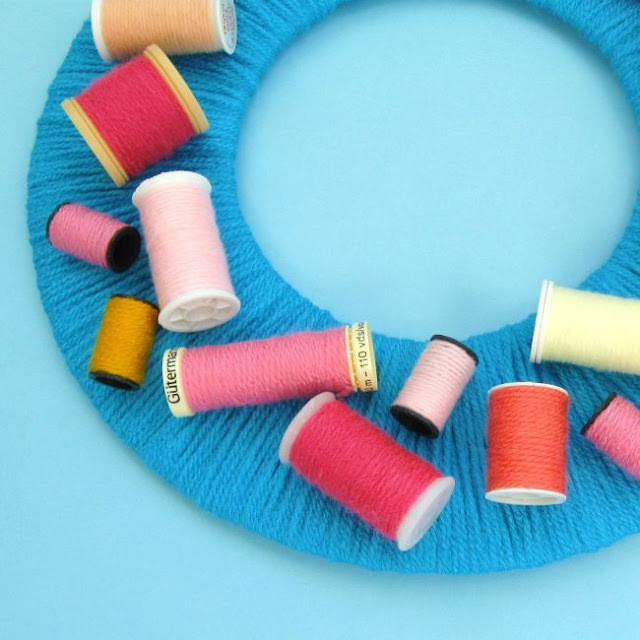 Once you've decorated all your spools, it's time to get out the glue and add them to your yarn-wrapped wreath base. I'd usually use a glue gun when sticking stuff onto wreaths but I often find glue guns quite awkward to work with and occasionally a bit messy (all those trailing strands of glue! and great squidges of glue that squeeze out from behind the thing you've just stuck in place!)... 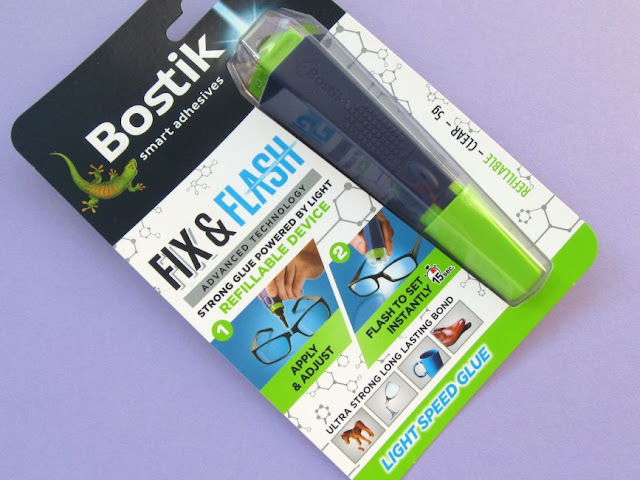 so I was really interested to try Bostik's new Fix & Flash glue. It turns out that using this stuff is half like being in a sci-fi film set in the future, and half like pretending to be a wizard because the glue sets like magic with a beam of light! First use the fine nozzle to apply the clear glue to the back of one of the sewing reels, where it'll touch the wreath base. I'd definitely recommend test glueing something to start with as I managed to splurge glue everywhere as it was much more liquidy than I'd been expecting. Carefully position the reel and press it in place for a few seconds to create the initial hold. 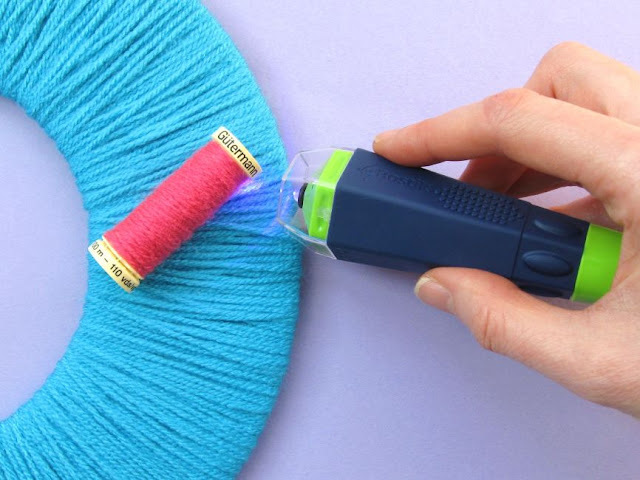 Then use the UV bulb at the other end to shine a beam of light for fifteen seconds onto the edges of where you've glued. And that's it! The glue has set. Make sure you follow the safety instructions when using the Fix & Flash (both the glue and the UV light), and gradually add all the reels to your wreath base. I set a little timer on my phone for 17 seconds so I could just tap that and easily time the amount of light needed. I will confess that I managed to get a bit of glue on my fingers when working on this project (oops) because I am quite clumsy and really ought to always wear latex gloves when using strong glue (because of the aforementioned clumsiness) but otherwise I was really pleased with how easy this stuff was to use. I definitely felt like I had more control over it than using a glue gun, and you can use Fix & Flash to glue loads of different materials. 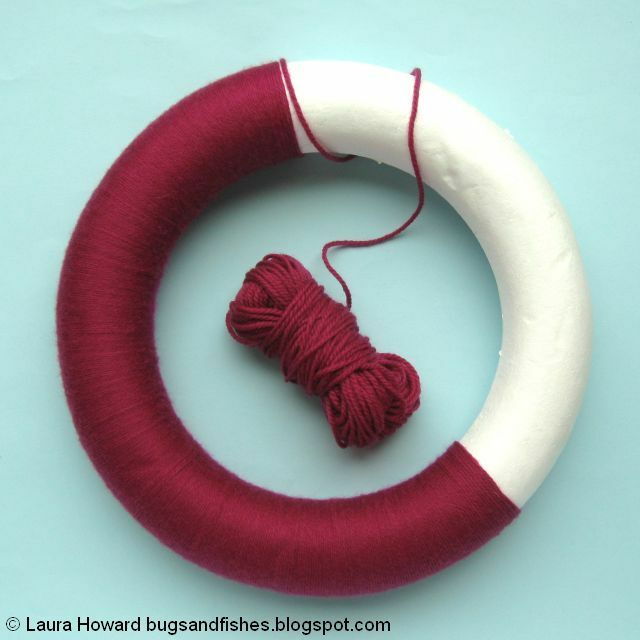 I would never have tried this without Bostik asking me to create this tutorial, but I'm glad I did as I think this will be a really useful addition to my craft supplies stash! Hang the wreath from a hook or nail using more of the same yarn you used to wrap the wreath base earlier. DISCLOSURE: this post is sponsored by Bostik, who also provided the Fix & Flash I used to make the wreath. P.S. Fancy some more free crafty goodness? Subscribe to my newsletter for a monthly free pattern and visit my crafty tutorial archive for lots more free projects. My monthly wreath project continues with a heart-themed wreath to celebrate Valentine’s Day, and to spread a little love and happiness! 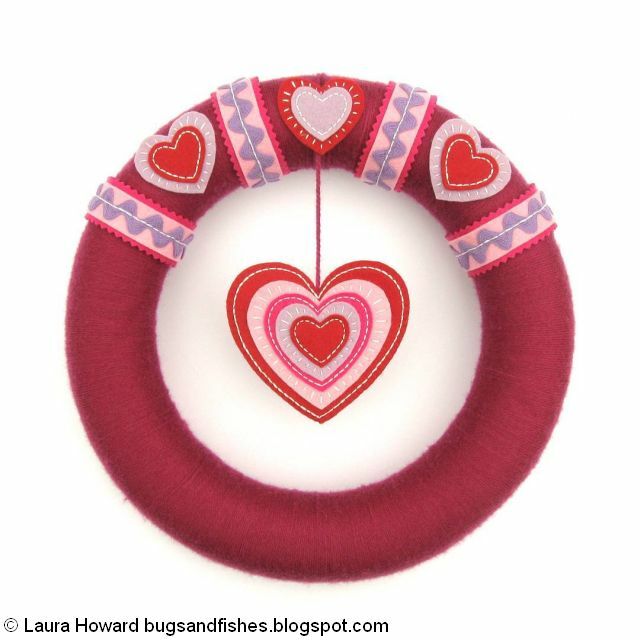 This month’s wreath features embroidered felt hearts, pretty ricrac and some gorgeous berry-coloured yarn. 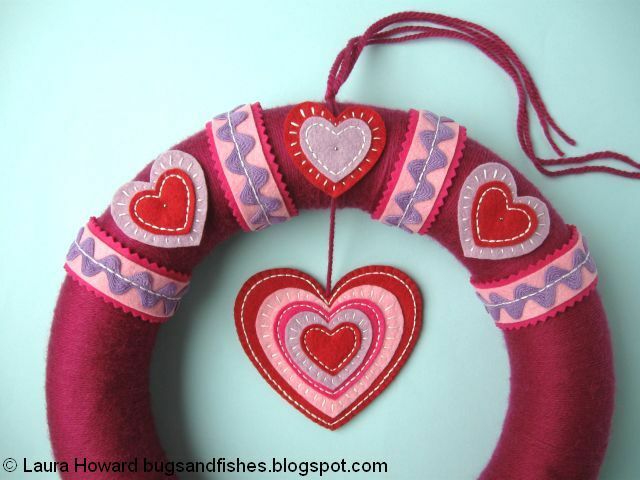 The hanging heart would also make a fab ornament on its own - simple add a coordinating ribbon loop and a matching backing heart (either cut a plain red felt heart or repeat the relevant steps to make two decorated hearts to join together). 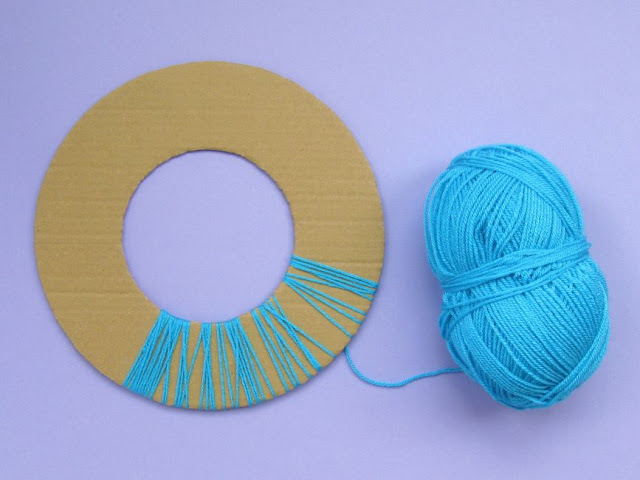 This tutorial originally appeared on The Village Haberdashery's blog - visit their shop for lots of crafty goodness! I'll be sharing all twelve seasonal wreath tutorials here on my blog as the year progresses - click here for January's rainbow wreath. 1. Decorate the wreath base with your chosen yarn. 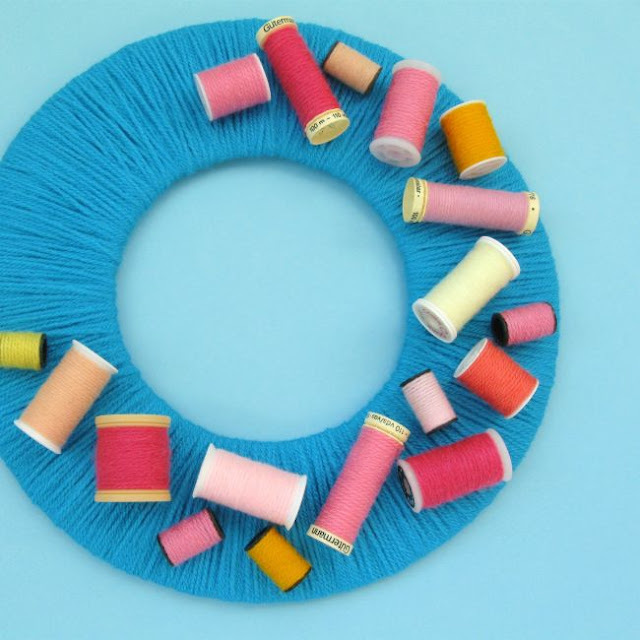 Secure the yarn with a knot at what will become the back of your wreath. Begin wrapping the yarn around the wreath base, passing the ball of yarn through the hole in the centre of the wreath as you wrap the yarn around the outside. Hide the loose yarn end under the yarn as you wrap, and make sure that you’re not leaving any gaps where the white wreath base shows through. Continue wrapping, gradually covering the whole of the wreath base, and switch to a second ball as needed. Wrapping the wreath takes a while, so I highly recommend wrapping your wreath while watching a film or some episodes of your favourite TV show! Once the whole wreath base has been covered with yarn, tie a knot securely at the back and carefully trim the loose end so it won’t be visible when the wreath is hung up. 2. 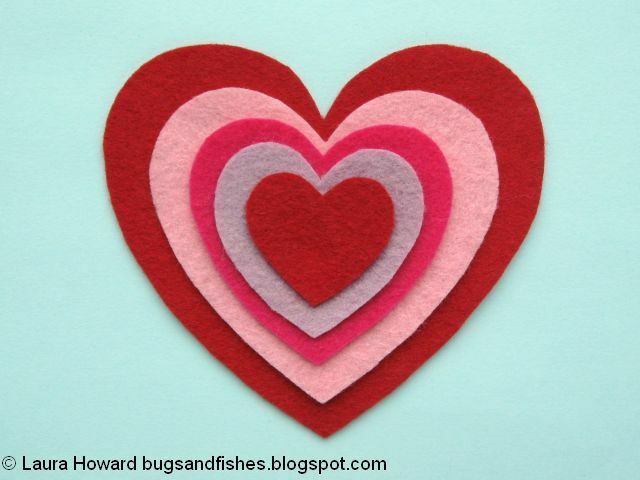 Use the templates provided to cut out the following felt pieces: 2 x Heart A in red, 1 x Heart A in lilac, 1 x Heart B in red, and 2 x Heart B in lilac. 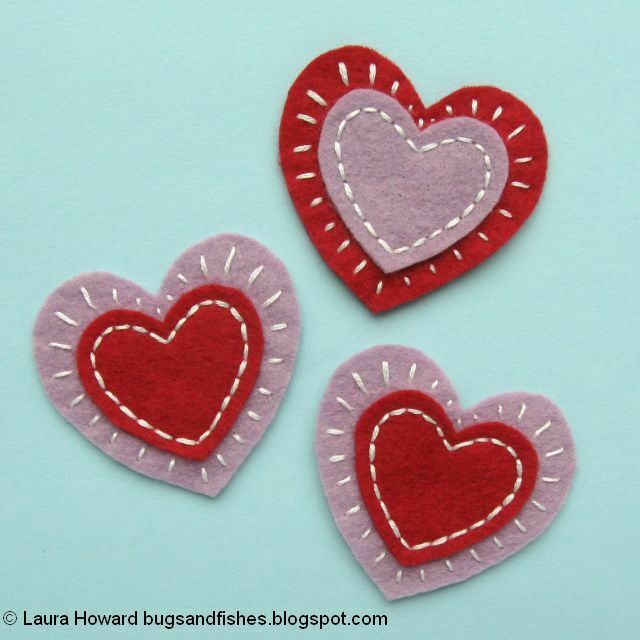 Tip: embroidery scissors are perfect for cutting out small felt shapes! 3. 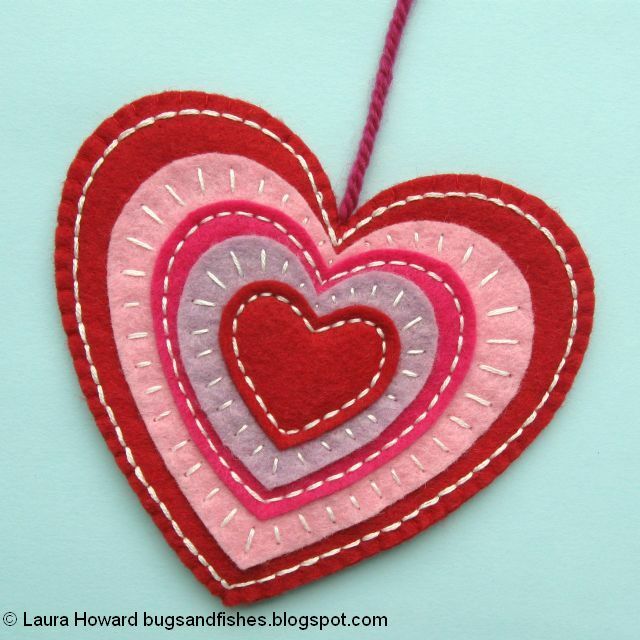 Place one of the smaller hearts in the centre of a contrasting larger heart. Cut a length of white embroidery thread and separate half the strands (so, just use 3 of the 6 strands). 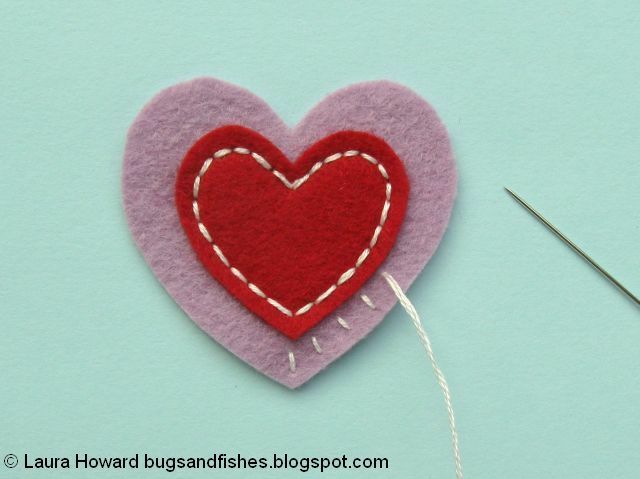 Hold the heart in position or secure it with a few tacking stitches of sewing thread. 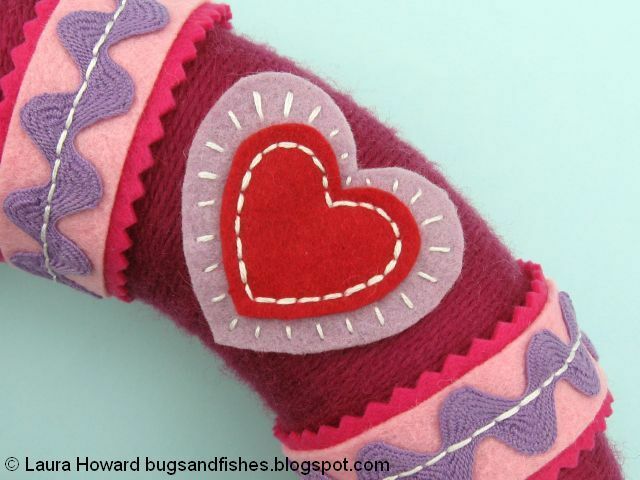 Use the embroidery thread to backstitch around the inside of the smaller heart, sewing through both layers of felt. 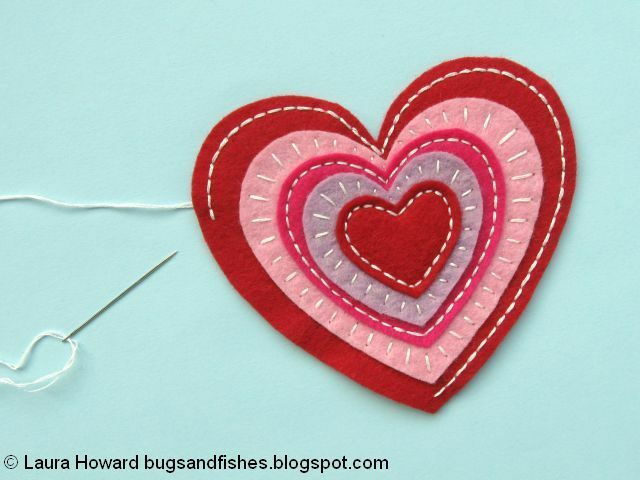 Then use more half strands of thread to sew a pattern of single stitches around the edge of the heart, varying the size of your stitches to fill the available space. Tip: smaller backstitches will help you sew a smoother curve. 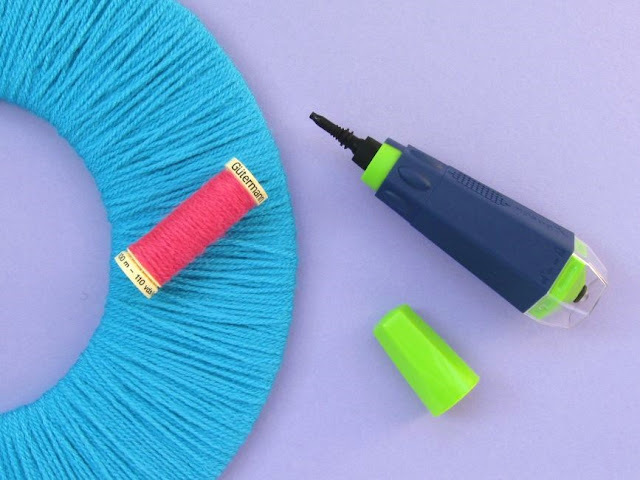 If you’re having difficulty sewing neatly freehand, use an air-erasable fabric marker to draw your stitching line(s). 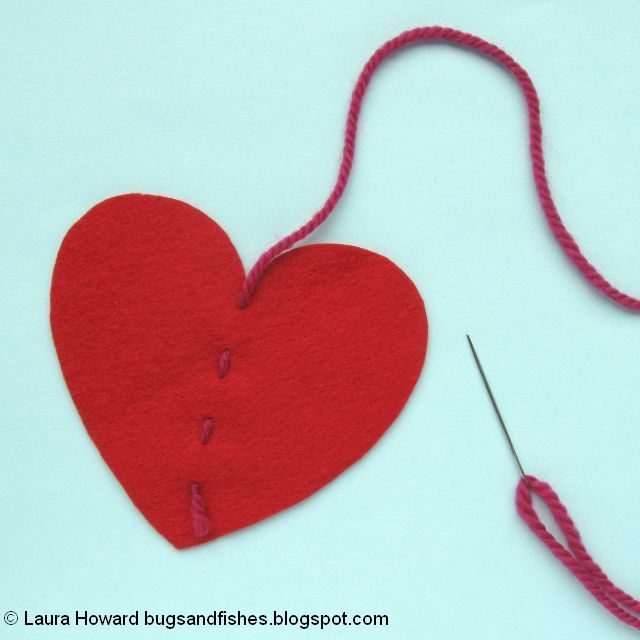 Remove any tacking threads (if you’ve used them) then repeat this step to decorate the other two pairs of hearts. 4. Use the templates provided to cut out one each of the following pieces: Heart A in red, Heart B in lilac, Heart C in bright pink, Heart D in light pink and Heart E in red. Arrange the heart shapes as shown. 5. Hold all the layers together, or secure them with a few small tacking stitches of sewing thread in the centre. 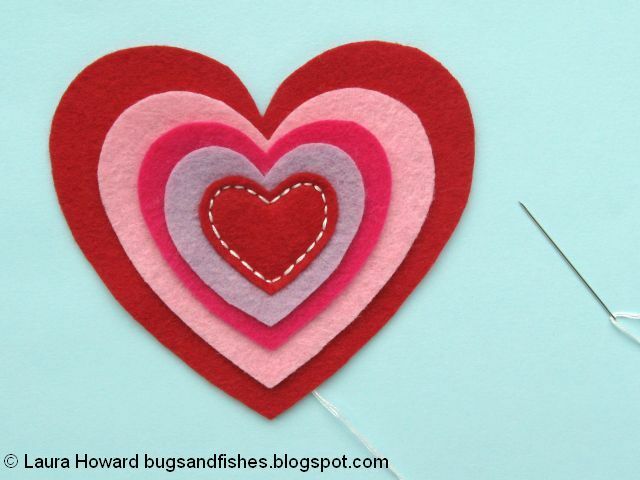 Use half strands of white embroidery thread to backstitch around the inside of the central heart, sewing through all the layers of felt. Remove the tacking stitches if you’ve used them. 6. Decorate the rest of the layers with more white embroidery thread - alternating between backstitch and single radiating stitches, as shown. 7. 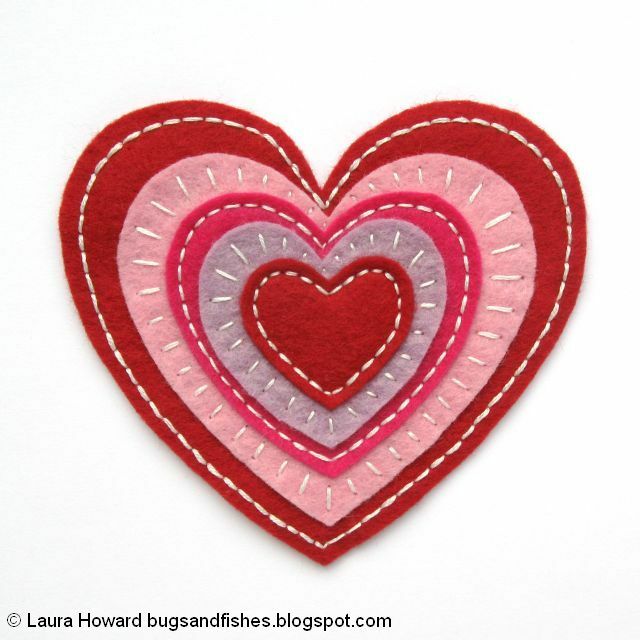 Use the Heart E template to cut a backing piece of red felt for the embroidered heart. Cut a 50cm length of the yarn you used to wrap the wreath. 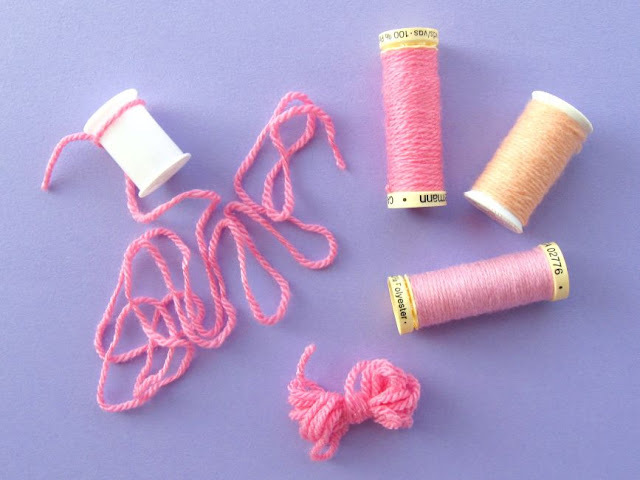 Thread a large, sharp needle with one end of yarn and tie a large knot in the other end. 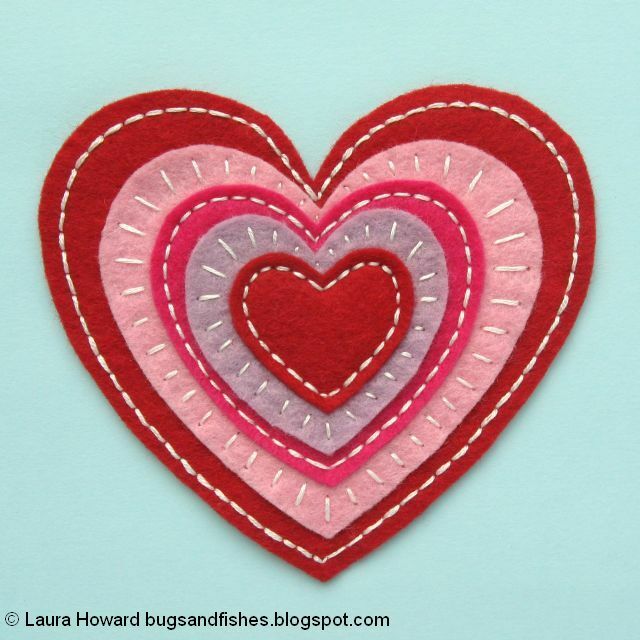 Then sew up the centre of the felt heart, as shown. 8. 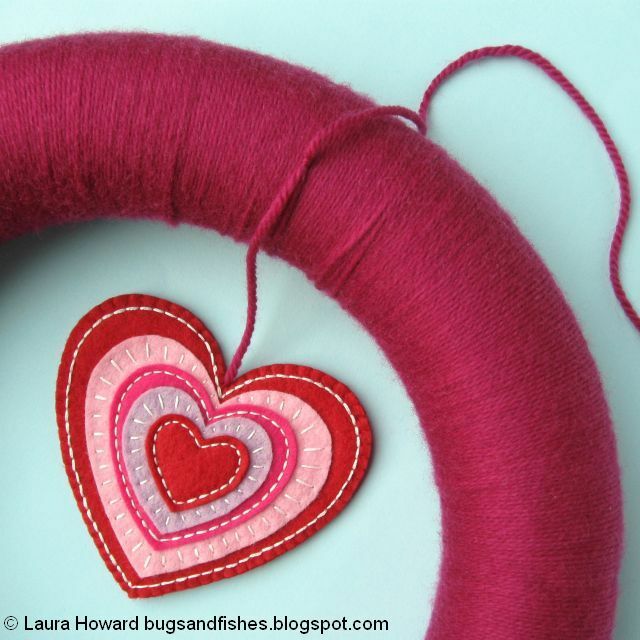 Place the decorated large heart and the plain backing heart together, so the knot of the yarn is hidden between the layers. 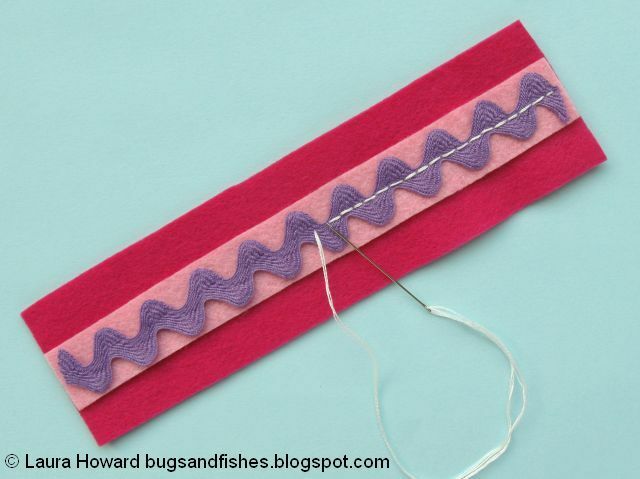 Hold or pin them together and join the edges with red sewing thread. I used blanket stitch for this because it creates a lovely neat edge, but you could use whip stitch if you prefer. Make sure the yarn end sticks straight up from the top of the heart as you sew around it, and finish your stitching neatly at the back. 9. 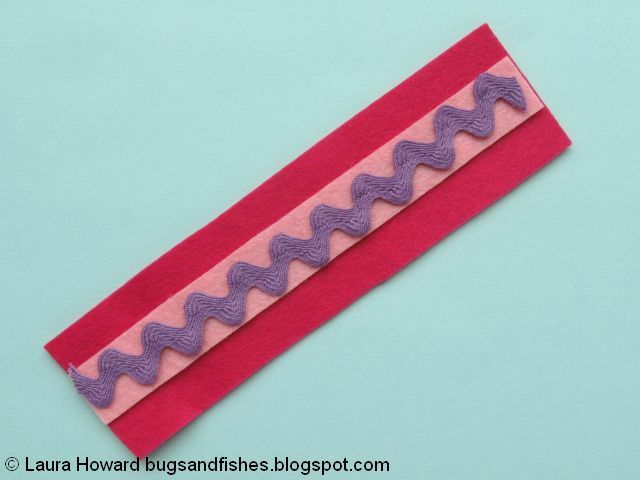 Use the Felt Strip template to cut out 4 pieces of light pink felt. Also use the template as a guide to cut 4 pieces of purple ricrac and 4 wider pieces of bright pink felt. Layer the pieces, as shown. 10. Use half strands of white embroidery thread to backstitch a straight line down the centre, sewing through all the layers. Repeat for all the ricrac and felt pieces, creating four decorated strips. 11. 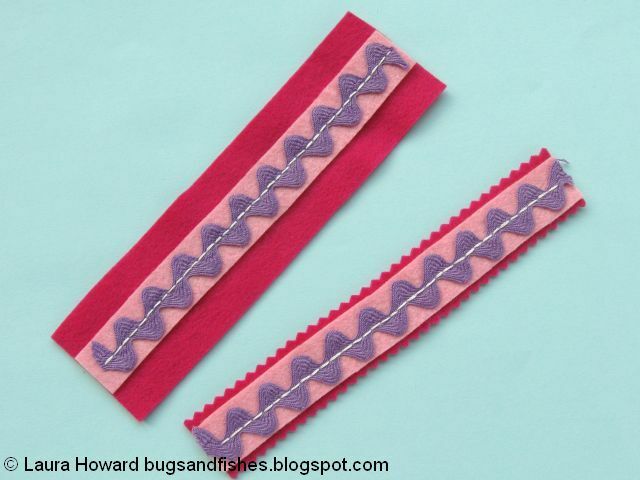 Trim the bright pink felt with pinking shears to create a decorative zigzag edging. 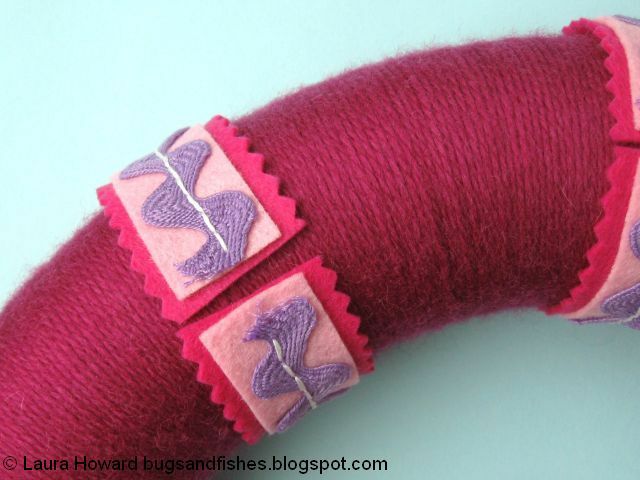 If you don’t have any pinking shears, just trim the felt with ordinary sewing scissors to create a narrow border. 12. 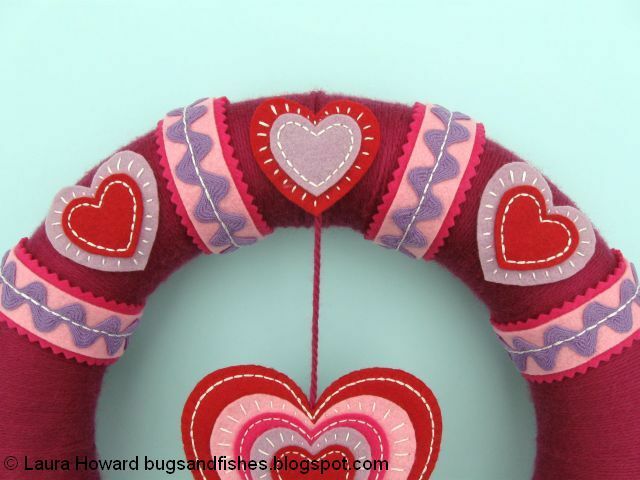 Hang the large embroidered heart from the top of the wreath. Adjust the height of the heart until you’re happy with it and wait for the yarn to stop spinning so you can make sure the heart will hang straight. 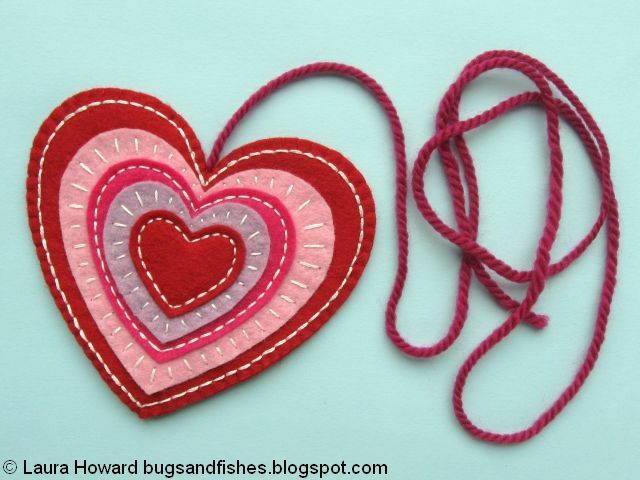 Once you’re happy with the position of the heart, knot the yarn securely and trim the excess yarn. 13. Position the felt pieces around the top of the wreath, as shown, pinning each shape in place. This is also a good time to add a length of yarn for hanging the wreath, if needed (i.e. if you’re not planning to hang the wreath directly on a hook or nail). 14. Turn the wreath over and use a glue gun to secure the ends of the decorated strips to the back of the wreath. Work on one strip of felt at a time, removing one pin and folding the end of the strip back slightly. 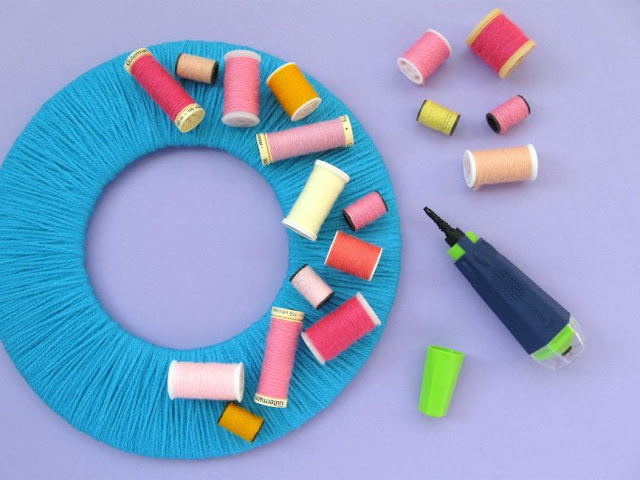 Carefully add a dab or two of hot glue to the wreath base then very carefully press the felt down into position. Then remove the pin from the other end of the strip and glue that in place. Repeat until you’ve removed all the pins and all four strips have been glued in position. 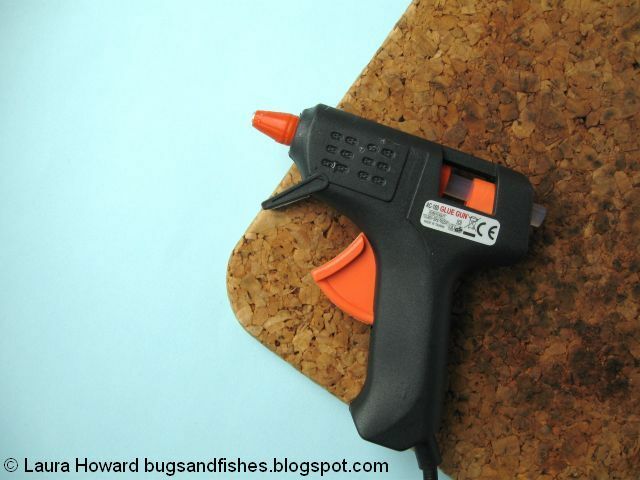 Tip: you may find it helpful to test glue a couple of scrap pieces of felt before you start, so you can see how much glue you need to use to hold each piece in place. 15. Once the glue has dried, turn the wreath over and begin gluing the four hearts in place. One by one, remove a pin and turn the heart over. Add two or three dabs of glue to the back of the heart then carefully press it back in position on the wreath.